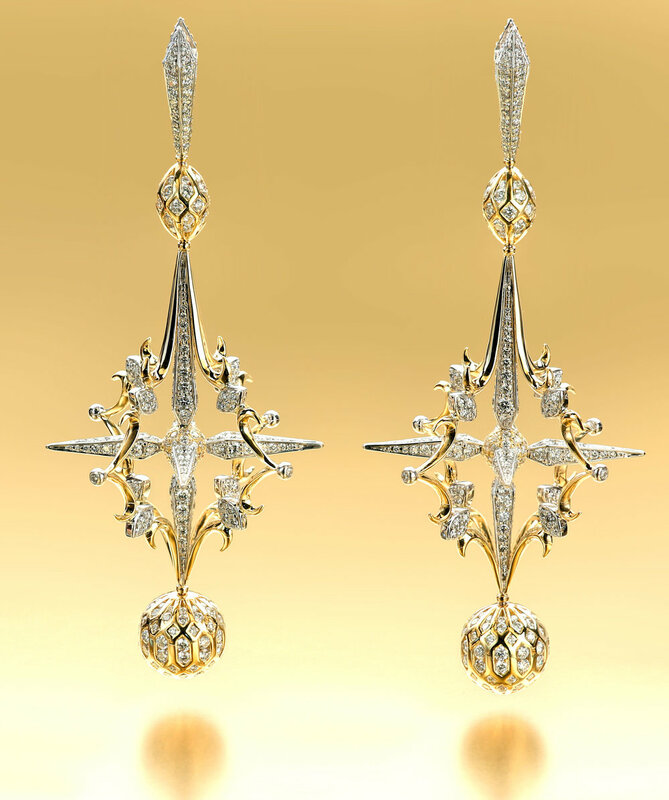 Susan Blennerhassett of Nedlands, Australia, a winner in the 2015 Saul Bell Design Award competition, received 2nd Place honors in the Gold/Platinum category for her incredible earring design, "Starstruck." We wanted to know more about the creative energy behind these stunning earrings and spent some time getting to know her. HOW DID YOU COME TO BE DESIGNING JEWELRY? I took a jewelry course option for art in year 10 at high school and really enjoyed the fine detail that could be applied to making jewelry. I had always been artistic and creative, so making it my chosen career seemed to be a natural progression after school. WHAT IS IT ABOUT DESIGNING THAT YOU ESPECIALLY LOVE? WHAT PART OF THE PROCESS DO YOU FIND DEMANDS THE MOST DISCIPLINE FROM YOU? AND WHAT PART DO YOU FIND COMES THE EASIEST TO YOU? The part that demands the most discipline is to not design a piece so complicated that it becomes impossible to make. For example I thought about making the diamond-set balls at the bottom of "Starstruck" interchangeable with pearls (not feasible). The thing I always find easiest is to add more diamonds! WHAT IS YOUR FAVORITE TOOL? WHAT TOOL (IF ANY) DO YOU STRUGGLE WITH? My favorite tool would be my Pastorino half-round pliers that I have had for 34 years now; they're just the perfect shape. I don't struggle with any particular tool; though, on a bad day, I might struggle with just about all of them! WHERE DO YOU TURN TO FIND YOUR BEST OR MOST RELIABLE INSPIRATION? I'm always inspired with unusual gemstones, but I also turn to everything around me, be it nature, architecture, people or animals—anything can be inspiration in design! HOW DO YOU WORK THROUGH THE CHALLENGES THAT ARISE AS YOU ARE WORKING TO BRING A DESIGN TO LIFE? With determination. And patience. And the odd glass of wine… With complex designs, I will often make a mock-up in silver to finalize a visual or to invent articulating sections that challenge the traditional methods. DESCRIBE YOUR IDEAL WORK AREA. HOW CLOSE IS THAT IDEAL TO YOUR CURRENT REALITY? My ideal work area would be one with good music and no phones. Unfortunately, I have a persistent phone right next to my bench that needs attention often. IF YOU HAD IT TO DO OVER AGAIN, WHAT, IF ANYTHING, WOULD YOU DO DIFFERENTLY…AND WHY? Everything I have done has led to me being where I am today, so therefore I wouldn't really change anything. ARE YOU WHERE YOU THOUGHT YOU WOULD BE (OR WANTED TO BE) WHEN YOU STARTED OUT AS A JEWELRY DESIGNER/MAKER? You can always want more, but at this point I am very happy with where I am and what I have achieved. Owning my own business with my husband, being free to design and create fine jewelry, and having a loyal following of clients, a lot of whom allow me to have creative control. Also having been recognized on a national—and now international!—level with the awards my work has achieved. WHEN YOU THINK ABOUT YOUR WORK IN THE OVERALL PATTERN OF YOUR LIFE, HOW DO YOU DEFINE THAT WORK IN YOUR OWN MIND? When I look back at my 34 years in jewelry, I am astounded by the variety of pieces I have made. I have been fortunate to come across the opportunities I have had but, at the same time, I've worked hard and put in long hours to get to where I am today. Due to this devotion, I have missed out on many other things during my life, but I don't regret that choice. Find out more about Susan's work at blennerhassett.com.au.